New designer pop-up, The Pommier, knows how to get customers into their Shoreditch pop-up – FREE BOOZE! 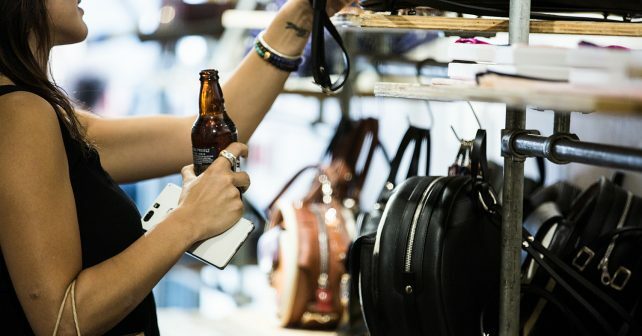 The fashionistas are giving away chilled bottles of beer or cider to thirsty shoppers who come in to browse their temporary store. No need to buy anything to qualify for FREE drinks, just ask for one at the counter. The jewellery retailer will be showcasing handmade fashion accessories from 25 up-and-coming and established designers from the UK and around the world. Highlights include pieces from Liwu Jewellery, Stephanie Bates and Toosis. Those popping in can also win fashion accessories from one of The Pommier’s designers. Keep an eye on their social media feeds or just ask inside their store for more details.